Lower Hopton just edged this last-16 tie in the West Riding County Challenge Cup. The Old Boys started slowly, not marking their men tightly enough, were slow to the second ball and were giving away possession needlessly. Lower Hopton exploited this and scored early on via a long punt up field which was not dealt with by the Old Boys’ defence and the ball was turned in by a Hopton forward. Old Boys didn’t learn from this and Hopton scored again, when another mistake in marking in defence saw a ball to the far post placed past keeper Jason Hibbert in the away goal. This seemed to wake the Brighouse lads up and, added to a rousing half-time team talk, the players at last came up to the mark. Tom Wright and Chris Wdowczyk in centre midfield started dominating possession, laying the ball off to wingers Peter Kuleczko and Jake Broadbent to set up the pacy Matthew Richardson and Richard Heins. Chances were created but not dispatched as both Richardson and Heins came close but to themselves and their team’s frustration these all went wide or were blocked by the desperate Lower Hopton defence. Fresh legs were called for and Connor Stoner came in on the left, Luke Gordon on the right and Jimmy Cummings in centre midfield. This seemed to galvanise them and finally they broke through. A corner on the right was met by a rocket header from Stoner, with the Lower Hopton keeper rooted to the spot. However, this was too late to effect the match, Lower Hopton playing the clock down much to the frustration of the Brighouse players and supporters. 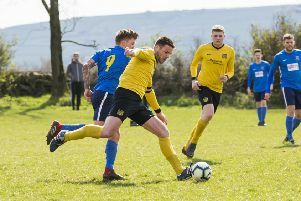 With this cup run over the old boys can get back to domestic fixtures, climbing up the Premier Division of the West Yorkshire League being their major priority.